Fallout 76 was announced with a lot of hype but also plenty of suspicion. The game’s 11th-hour beta stirred the pot even more, as it seemed far too late to integrate any necessary changes gleaned from the beta. And then the game landed with acknowledged bugs and a different experience than what fans expected. It’s clearly a work in progress, but is it even worth your time now? Let’s find out. If you’ve played Fallout 3, then Fallout 4 wasn’t much of a change outside of the menu-driven build/craft process. And thus, Fallout 76 won’t throw you off much either. The basic controls are like any Bethesda first-person RPG, with similar pros (they get the job done) and cons (it’s not as fluid as a refined FPS). Easily the biggest control difference is VATS. Given that this is an online game, the standard process of freezing time and selecting a target isn’t feasible. Instead, VATS is essentially an auto-lock system, which means you won’t have the precision of disabling a limb or going for headshots. Given the nature of the game, that’s somewhat expected. Much like The Elder Scrolls Online mirrors the graphical quality of Skyrim, Fallout 76 is essentially a doppelganger for Fallout 4. There are some issues with lighting, load distances, and other glitches — due most likely to a combination of Bethesda’s historically shaky launch periods and the fact that the game is a work in progress. From a design perspective, there’s more variation in Fallout 76 than Fallout 4; whether this was a conscious decision or simply the nature of changing the timeline/location context is unclear, but it feels more lively and colourful than Bethesda’s previous wasteland effort. For starters, a few things have changed for your character. Perks are handled much differently; rather than selections, you receive cards from packs after leveling up. This means they’re random, so if you’re wanting to beef up lockpicking or melee power you’ll need to grind and unlock them. Perk cards can be combined and boosted in a specific number of slots, similar to the materia system in Final Fantasy VII. You’ll need those perks because there aren’t many resources out there. Ammo, bobby pin lockpicks, and other consumable items are really hard to come by. This may be balanced in a later update, but for now, it’s frustrating — yes, the world is realistically barren, but it’s still a Fallout game rather than, say, Don’t Starve. Despite Bethesda announcing that there’d be a strong survival aspect, the lack of resources is a drag and detracts from simply enjoying the online world. Another annoying survival aspect involves food and water, leads to an issue with inventory management. The level of limited inventory space (read: over-encumbered) combined with survival and aforementioned lack of resources reminds me of some of No Man’s Sky’s initial issues – it was vastly overhauled via patches but was hindered at launch through its mining/resource management. It’s the same thing here, but for a game that emphasizes crafting and combat, the limitations are frustrating. When Bethesda announced “no NPCs,” they weren’t kidding. 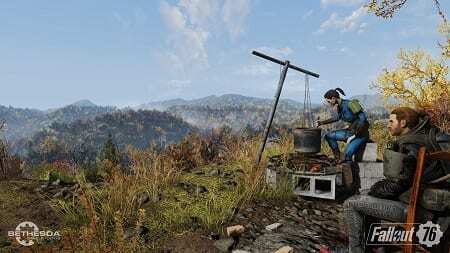 Fallout 76 can feel vast and empty because of this. Which, given the timeframe of the game, fits. On the other hand, that emptiness can be a bit overwhelming and/or boring at times, even though you’ll constantly have quests to handle. Those arrive in several ways, but always through scavenging: letters, recordings, and other items will be your key to populating your quest list. Quests can be achieved individually or in groups, and if you handle it as a group, someone will be designated the leader. If you’re merely supporting, you get the XP and loot but you won’t technically complete the quest. This takes some getting used to, and in some ways feels like a hindrance. Technical specs show that currently each player is loaded onto a server with 23 others, which… isn’t a lot. And because you join a new server each time, there’s little lasting impact on the world, even though your character’s progress remains. This doesn’t include robot NPCs, which exist and provide quests, info, and some level of companionship. But if you were hoping for memorable companions like Fawkes or Cait, it’s not happening, at least not yet. If that sounds like a lot of frustration, well, it is. The good news is that it feels like the Fallout experience, and combat has been a little more refined (melee feels particularly better than before). The world’s trademark blend of melancholy and humour is still there, and it’s actually cool knowing that every person you see is a real person on the server. There’s a strong emphasis on collaboration; it’s simply easier that way, and while PvP is always on, there’s really no reward or purpose to it. So far, it feels like most players have realized that in the apocalypse, it’s better to get along. That leaves this launch period as a true mixed bag, and it’s unclear what the final state will be. For long-time Fallout fans, they will probably be split, as the potential is clear, but some of the design choices and execution are questionable. Fallout 76 landed with a lot of hype but some clear issues at launch. MMOs typically need some significant time to find a groove, and the game may be more robust and more interesting six months from now so consider this a “score in progress.” As it stands currently, there’s no pressing need to take time away from the likes of Red Dead Redemption II or Assassin’s Creed Odyssey to visit the wasteland just yet. At roughly 10-to-12 hours (more if you hunt for collectibles and do optional assassinations), Wolfenstein II is well-paced. There are several intense set pieces, though nothing that we’d consider to be a boss fight in the traditional sense, and tough encounters alongside exploration and lighter fare — such as a mission to find your friend’s mechanical arm — that serve as palette cleansers. Set after the events of Dishonored 2, Death of the Outsider casts you as Billie Lurk, who returns to the city of Karnaca seeking her mentor Daud (AKA, The Knife of the Dunwall). After tracking him to a fight club she is able to free the ailing assassin, and Daud asks that Billie help him with one final job: to kill the Outsider, the mysterious source of all magic in the world. From there the game becomes one of discovery as you attempt to piece together the events that have led to mimics gaining control of the station, including their origins, the experiments and innovation taking place on Talos I, your brother’s culpability in said events and your own as well. It’s an interesting journey, one that takes a few twists and turns along the way. Simply put, Dishonored 2 has some of the most inventive level design we’ve ever seen in video games. Starting off with the opening scene and the initial choice of Emily or Corvo as your playable character, each level builds upon each other, at first feeling like Dishonored 1.5. Then, about a third of the way through the game, you hit the Clockwork Mansion and suddenly it begins to wow you.